The HW715 EncorePro is the top-of-the-range in the latest generation of corded-headsets from Plantronics. It's designed for use specifically with PCs and Softphones - NOT for use with desk phones. 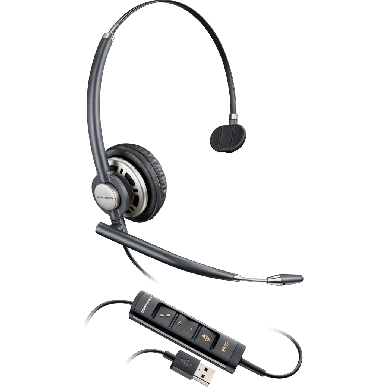 That makes it perfect for large operations because this USB headset keeps track of inventory AND its usage and updates, plus, settings can be updated & locked in, en masse, via Plantronics' Manager Pro Software. How's that for peace of mind? NB: This headset is not suitable if you wish to use it for training or coaching. If you need that functionality, we recommend you check out the HW715D and DA90 Cable bundle. The clever HW715 works with Plantronics Manager Pro to give you a fully-integrated audio and asset management solution that is specifically-designed for call centres and large corporations. IT departments will love this headset. They can see where the headset is, plus how much it's being used and can then roll out firmware updates en masse - even notifying the users. Troubleshooting can be performed remotely and the settings can be easily controlled by the user, within parameters set by the IT department via the software. The HW700USB headsets are headband-only option (the norm for corded headsets). They come in a mono and duo (on both ears) model. This one is mono. The Encore Pro Digital series are all optimised for use with major softphone brands, as well as Skype for Business. Previous USB headsets have had Skype for Business and standard versions but this is all built into the one headset now, so you don't need to worry about what might happen if you switch to a different platform in the future. Easy! The HW700 USB headset series are the executive-level USB-corded headset in the Plantronics range, with luxurious soft leatherette ear cushions and wideband technology to offer superior sound quality. The telescopic noise-cancelling microphone is easily extendable for precise placement - something that ensures perfect listening and audio clarity. Because the earcup is attached to the headband by a ball & socket joint, it sits perfectly for additional comfort. Made of high-grade nylon composite materials, this is a very light - but also durable - headset that's designed to be worn all day. It has a telescopic microphone arm, so the mic can be placed in the optimum position - and stays out of your line of sight. The noise-cancelling microphone in this model is the best in Plantronics USB range, so callers hear you and only you. The high-quality wideband sound in both earcup and mic mean you get sensational, natural-sounding calls via VOIP. For your protection, it also has Plantronics Soundguard, to minimise risk of acoustic shock from loud & sudden noises, as well as regulate the overall average volume level to a safe daily level. Clearly, the trackable and monitorable features that the Encore Pro Digital series offers will appeal to any IT Manager of a large organisation - but it's not just the big guys that will benefit! If your IT person is also your Office Manager, or if you have an external IT expert, you can save so much time by rolling out updates in one stress-free go. Your staff can be advised in advance of the change, so they ensure the headset is left plugged in and firmware updates can be executed out-of-hours to minimise disruption and loss of work hours. It's complete convenience and means that, when Jimmy's headset goes walkabout AGAIN, you can check where it was last plugged in, or where it's plugged in now. No need to rifle through every drawer and cupboard in the office any more! Corded-headsets are no longer the norm in offices. Cables get under papers on desks and you're literally tethered to your PC. Boring! These days, most people (particularly executives) expect and require the freedom that a wireless device can offer. If you're looking at this model, quality is clearly more important than price to you, so we strongly recommend you look at some of the top-of-the-range wireless offerings, which enable users to get more done in a day. For enterprises with large volume UC rollouts who need the ability to monitor usage AND keep track of location of the headset, as well as roll out firmware upgrades, this is a great lower cost option. Be aware that the Digital HW5X5 series is ideal for all corded users but not adaptable for on-call training. The Jabra alternative Jabra Biz 2400 ii USB has three wearing styles, or the excellent Sennheiser SC 630 USB is pretty much the USB-corded headset with the best quality sound on the market for voice communications. If it's a noisy environment, the duo version HW725 will help block out colleagues. If you want the productivity, freedom and engagement that comes free of charge, with a quality wireless headset, check out the Jabra Pro 930 Series and the Plantronics Savi W440, or the gorgeous Sennheiser DW Pro 1 USB.